Can you read a food label? For me it was just another example of how food manufacturers are desperate to keep information about exactly how food is made to themselves. They'd probably call it 'good marketing' - after all we all know certain food are high in sugar and fat - and kind of like to forget the details sometimes and just enjoy a treat. But the problem really is, that we can't really tell what is a treat anymore - hidden (and often unnecessary IMHO) sugars and hard-to-pronounce chemicals litter the labels of prepared food. Low-fat foods are a prime example of clever labelling - as they often have extra sugar to make the end product taste appealing instead - a kind of giving with one hand and taking away with the other approach. While in a perfect world we'd make everything from scratch, it would be nice if we could just grab and go from time to time - but I think those that are selling us that dream don't want us to ask too many questions. Ignorance is bliss after all! But maybe it's time to wise up? Taking a break is always a pleasure - and should leave us refreshed and revived. So it's not surprising that a holiday is often a source of inspiration too. Take us out of our comfort zone and we can look with fresh eyes at the world around us - be it filled with natural beauty, cultural delights or stimulating scenery. How often have you come back from a trip feeling stimulated by something you saw or experienced and/or relaxed enough to tackle tasks that seemed daunting beforehand? 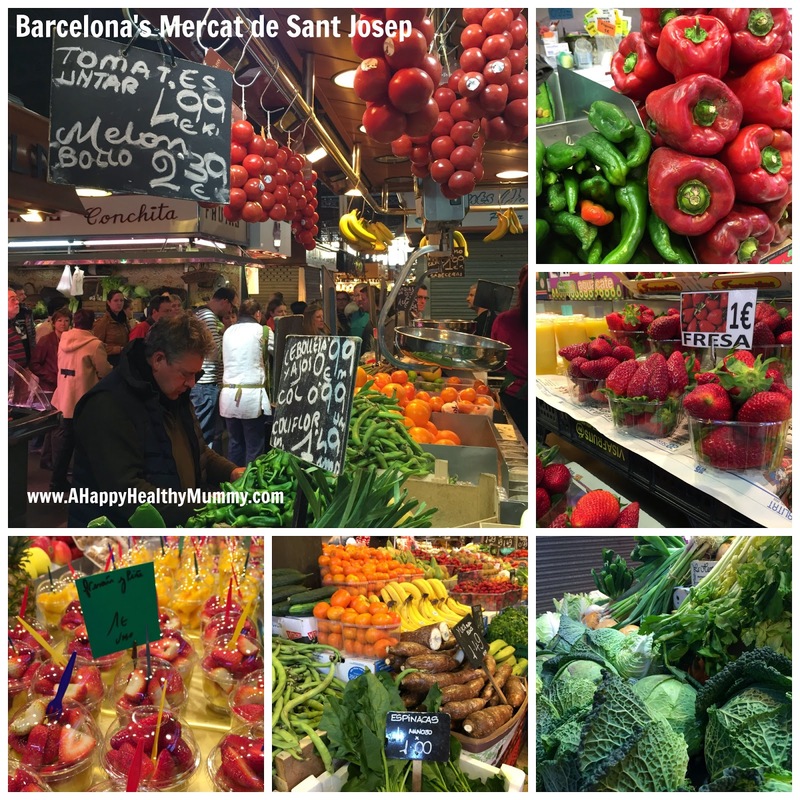 This is how I felt when I happened across the magnificent Mercat de Sant Josep on La Rambla in Barcelona. A huge walk-through affair that is a magnet to tourists and locals alike, packed to the rafters with tempting, fresh foods. Stepping across the threshold brought back vague memories of how people used to shop in the UK, before superstores, ready meals and ordering online became the norm. At this market individual traders ply everything from fruit and veg, fresh fish, meat, eggs and dried mushrooms to sweets treats and baked goods. They call out to you, ready to bargain. You can touch and examine their wares - they expect questions and conversation. It's a feast for the eyes and ears sure - and full of locally-sourced, fresh and nutritious foods. You can even sit down and have some freshly made tapas. How long is it since you spoke to a fishmonger? And it hit me that we have become too used to looking at photoshopped images, motivational phrases and hashtags like #eatclean, #weightlossjourney and #fittip when we need a reminder to make healthy lifestyle choices. I remember going grocery shopping with my mum when I was small. She took her own bags (I was always transfixed by the wicker baskets people used) and walked to the green grocers for fruit and veg and another shop for milk and cheese, you bought fish when you were by the harbour and meat came from the butcher's (okay, that just happened to be my Dad!!). Mum made everything from pastry to stock and I (and my brother) stood alongside her learning how to cook. Properly.